Kayaking is nice and soothing. 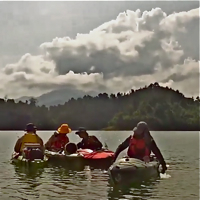 With inflating kayaks, you can hike with your compacted boat (on your back), and then inflate it when you want to paddle. What were you eating on that trip? I love to see how you manage your hammock set up. Every new experience I have, I make adjustments in my method; sometimes I replace a piece of equipment, often I remove one that I dont really need. But more importantly I change my way of doing things, it gets smoother to set up camp. 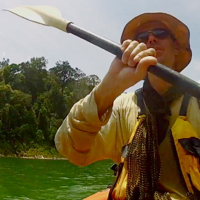 Glad you liked the video and I agree that kayak is very relaxing! I’ve seen some of the inflatable kayaks in the shops and also on the series done by Ed Stafford when he walked the Amazon as he had to criss cross it at times and used the inflatable then. On that trip I was eating the usual (sardines and rice) with some snacks, bread and soup to keep me going during the day. I know what you mean about continually adjusting the set up and gear – I do the same and each time i think I’ve got it just right I then find some other modification to make! I’ve been kayaking for a couple of years now and I have to agree that the connection to your surroundings is much greater. Gliding over the water can make a good day great. Also having a proper chair, real food and cold beer can make the whole trip a lot of fun. Many thanks for comment and I absolutely agree that a being able to take along more stuff (particularly a beer or few!) is a real bonus when it comes to kayaking!